(Leah Hogsten | The Salt Lake Tribune) The Rev. France A. Davis and his wife Willene, celebrated Davis' 44th anniversary as pastor at Calvary Baptist Church. The two are greeted and congratulated by members of the congregation, Sunday, April 22, 2018, as they enter the nave. Davis, who arrived in Salt Lake City in 1974, has built the African-American congregation to more than 700 members. 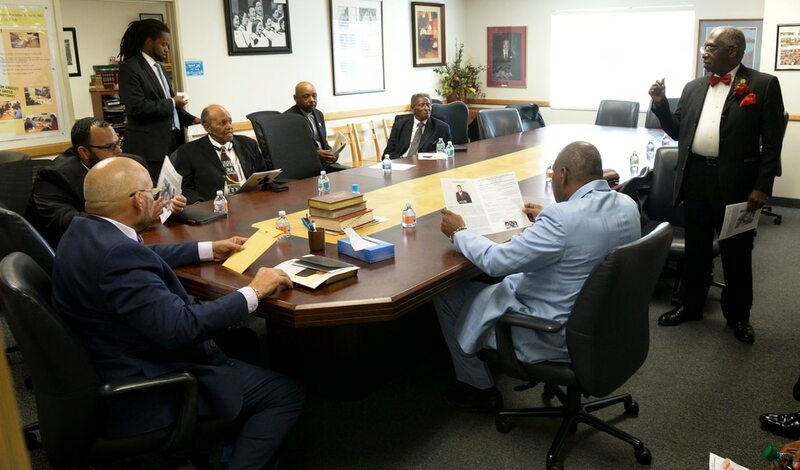 Calvary Baptist Church, one of Utah’s largest and oldest African-American congregations, celebrated the Rev. France Davis’ 44th anniversary of ministry Sunday. The special 3:30 p.m. service of preaching, singing and prayer at the church, 1090 S. State St. in Salt Lake City, was presided over by the Rev. Michael Ross, pastor of Boise’s St. Paul Baptist Church. Davis, a veteran of the Rev. Martin Luther King Jr.’s civil rights campaigns of the 1960s and a participant in the historic Selma-to-Montgomery, Ala., voting rights march, came to Utah in the early 1970s and became Calvary’s pastor in 1974. Under his leadership, the church has garnered a reputation for community and civil service as its congregation has grown to more than 700 members. (Leah Hogsten | The Salt Lake Tribune) The Rev. France A. Davis celebrates his 44th anniversary as pastor at Calvary Baptist Church with members of his congregation, Sunday, April 22, 2018. Davis, who arrived in Salt Lake City in 1974 with his wife Willene Davis, has built the African-American congregation to more than 700 members. (Leah Hogsten | The Salt Lake Tribune) Calvary Baptist Church members honored Rev. France A. Davis, who celebrated his 44th anniversary as pastor with visiting pastors, ministers, family and members of his congregation, Sunday, April 22, 2018. (Leah Hogsten | The Salt Lake Tribune) The Rev. France A. Davis celebrated his 44th anniversary as pastor at Calvary Baptist Church with several visiting pastors, Sunday, April 22, 2018. Davis, who arrived in Salt Lake City in 1974 with his wife Willene Davis, has built the congregation to more than 700 members. 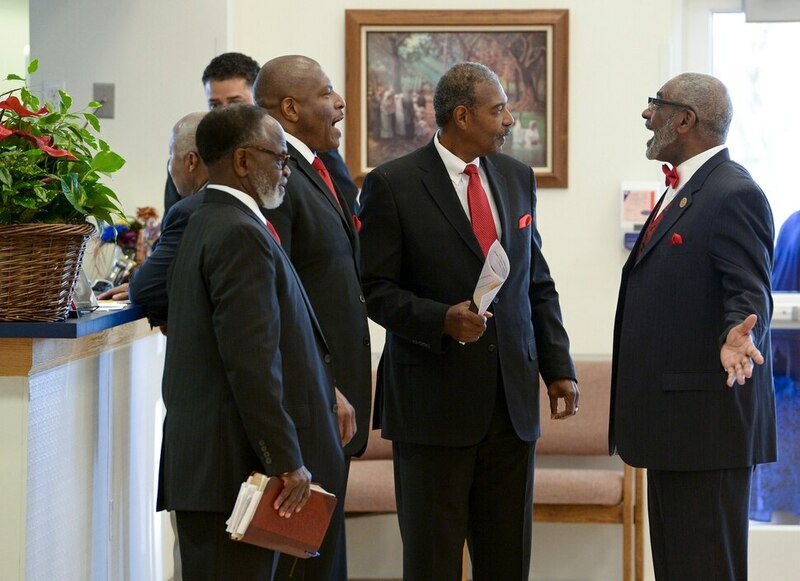 (Leah Hogsten | The Salt Lake Tribune) Calvary Baptist Church deacons and members greet each other prior to the worship service to honor Rev. France A. Davis, who celebrated his 44th anniversary as pastor with visiting pastors, ministers, family and members of his congregation, Sunday, April 22, 2018. (Leah Hogsten | The Salt Lake Tribune) The Rev. France A. Davis celebrates his 44th anniversary as pastor at Calvary Baptist Church with church deacons and deaconesses, Sunday, April 22, 2018. Davis, who arrived in Salt Lake City in 1974 with his wife Willene Davis, has built the congregation to more than 700 members. (Leah Hogsten | The Salt Lake Tribune) The Rev. France A. Davis and his wife Willene, celebrated Davis' 44th anniversary as pastor at Calvary Baptist Church. The two are greeted and congratulated by members of the congregation, Sunday, April 22, 2018, as they enter the nave. Davis, who arrived in Salt Lake City in 1974, has built the African-American congregation to more than 700 members. (Leah Hogsten | The Salt Lake Tribune) The Rev. France A. Davis and his wife Willene, celebrated Davis' 44th anniversary as pastor at Calvary Baptist Church. The two are greeted and congratulated by members of the congregation, Sunday, April 22, 2018, as they enter the nave. Davis, who arrived in Salt Lake City in 1974, has built the African-American congregation to more than 700 members. (Leah Hogsten | The Salt Lake Tribune) The Rev. France A. Davis and his wife Willene, celebrated Davis' 44th anniversary as pastor at Calvary Baptist Church. The two are greeted and congratulated by members of the congregation, Sunday, April 22, 2018, as they enter the nave. Davis, who arrived in Salt Lake City in 1974, has built the African-American congregation to more than 700 members. (Leah Hogsten | The Salt Lake Tribune) l-r Members of Calvary Baptist Church laugh with Willene Davis as she pays tribute to her husband Rev. France A. Davis during Sunday's celebration of Davis' 44th anniversary as pastor, April 22, 2018. (Leah Hogsten | The Salt Lake Tribune) The Rev. France A. Davis wipes tears from his eyes during his 44th anniversary celebration as pastor at Calvary Baptist Church, Sunday, April 22, 2018. Davis, who arrived in Salt Lake City in 1974, has built the African-American congregation to more than 700 members. (Leah Hogsten | The Salt Lake Tribune) l-r Members of Calvary Baptist Church laugh with Willene Davis as she pays tribute to her husband Rev. France A. Davis during Sunday's celebration of Davis' 44th anniversary as pastor, April 22, 2018. (Leah Hogsten | The Salt Lake Tribune) Calvary Baptist Church members sing during the worship service to honor Rev. France A. Davis, who celebrated his 44th anniversary as pastor with visiting pastors, ministers, family and members of his congregation, Sunday, April 22, 2018. Davis, who arrived in Salt Lake City in 1974 with his wife Willene Davis, has built the congregation to more than 700 members. (Leah Hogsten | The Salt Lake Tribune) The Rev. France A. Davis laughs as people pay tribute to him during his 44th anniversary celebration as pastor at Calvary Baptist Church, Sunday, April 22, 2018. Davis, who arrived in Salt Lake City in 1974, has built the African-American congregation to more than 700 members. (Leah Hogsten | The Salt Lake Tribune) Calvary Baptist Church choir members sing during the worship service to honor Rev. France A. Davis, who celebrated his 44th anniversary as pastor with visiting pastors, ministers, family and members of his congregation, Sunday, April 22, 2018. Davis, who arrived in Salt Lake City in 1974 with his wife Willene Davis, has built the congregation to more than 700 members. (Leah Hogsten | The Salt Lake Tribune) Calvary Baptist Church members sing during the worship service to honor Rev. France A. Davis, who celebrated his 44th anniversary as pastor with visiting pastors, ministers, family and members of his congregation, Sunday, April 22, 2018. Davis, who arrived in Salt Lake City in 1974 with his wife Willene Davis, has built the congregation to more than 700 members. (Leah Hogsten | The Salt Lake Tribune) Calvary Baptist Church choir members sing during the worship service to honor Rev. France A. Davis, who celebrated his 44th anniversary as pastor with visiting pastors, ministers, family and members of his congregation, Sunday, April 22, 2018. Davis, who arrived in Salt Lake City in 1974 with his wife Willene Davis, has built the congregation to more than 700 members. 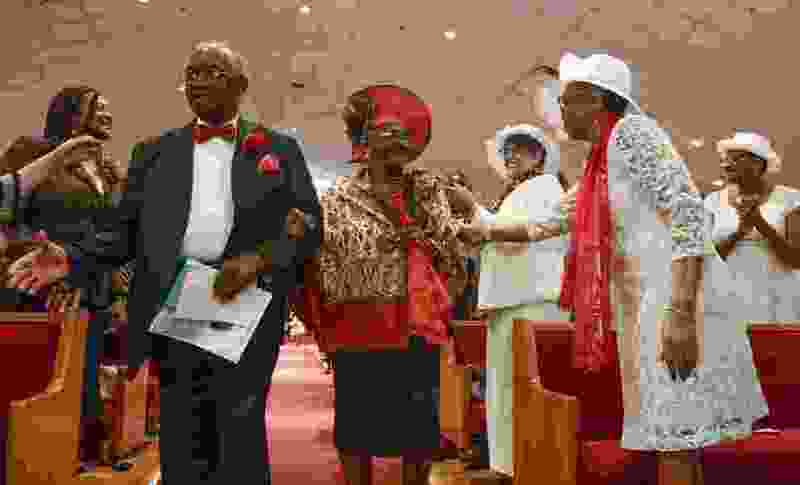 (Leah Hogsten | The Salt Lake Tribune) Willene Davis is honored and celebrated for her service from Calvary Baptist Church members during the 44th anniversary celebration service for her and her husband, Rev. France A. Davis, Sunday, April 22, 2018. (Leah Hogsten | The Salt Lake Tribune) The Rev. France A. Davis laughs as people pay tribute to him during his 44th anniversary celebration as pastor at Calvary Baptist Church, Sunday, April 22, 2018. Davis, who arrived in Salt Lake City in 1974, has built the African-American congregation to more than 700 members. (Leah Hogsten | The Salt Lake Tribune) Guest Pastor Michael J. Ross, Sr., of St. Paul Baptist Church in Boise (center) delivered the anniversary sermon in honor of Rev. France A. Davis, celebrating his 44th anniversary as pastor at Calvary Baptist Church, Sunday, April 22, 2018. (Leah Hogsten | The Salt Lake Tribune) Guest Pastor Michael J. Ross, Sr., of St. Paul Baptist Church in Boise (center) delivered the anniversary sermon in honor of Rev. France A. Davis, celebrating his 44th anniversary as pastor at Calvary Baptist Church, Sunday, April 22, 2018. (Leah Hogsten | The Salt Lake Tribune) l-r Willene Davis and her husband Rev. France A. Davis celebrate Davis' 44th anniversary as pastor at Calvary Baptist Church with church members, Sunday, April 22, 2018. (Leah Hogsten | The Salt Lake Tribune) The Rev. France A. Davis celebrates his 44th anniversary as pastor at Calvary Baptist Church with members of his congregation, Sunday, April 22, 2018. Davis, who arrived in Salt Lake City in 1974 with his wife Willene Davis, has built the congregation to more than 700 members. (Leah Hogsten | The Salt Lake Tribune) The Rev. France A. Davis celebrates his 44th anniversary as pastor at Calvary Baptist Church with members of his congregation, Sunday, April 22, 2018. (Leah Hogsten | The Salt Lake Tribune) The Rev. France A. Davis celebrates his 44th anniversary as pastor at Calvary Baptist Church with members of his congregation, Sunday, April 22, 2018. Davis, who arrived in Salt Lake City in 1974 with his wife Willene Davis, has built the African-American congregation to more than 700 members. (Leah Hogsten | The Salt Lake Tribune) Willene Davis shares a moment with her son and grandsons after the celebratory service in honor of her and her husband Rev. 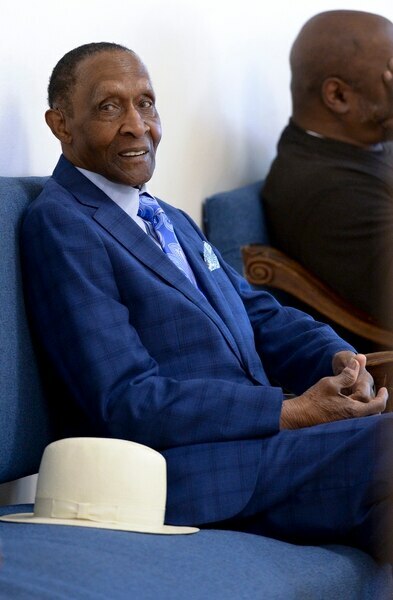 France A. Davis, who celebrated his 44th anniversary as pastor at Calvary Baptist Church, Sunday, April 22, 2018. (Leah Hogsten | The Salt Lake Tribune) The Rev. France A. Davis celebrates his 44th anniversary as pastor at Calvary Baptist Church with members of his congregation, Sunday, April 22, 2018. Davis, who arrived in Salt Lake City in 1974 with his wife Willene Davis, has built the congregation to more than 700 members.